Astoria is like its own little city in the northwestern section of Queens. No need to travel to Manhattan, everything a family needs is right here. 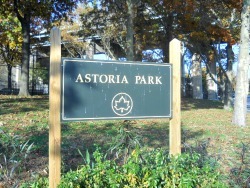 Highlights include the 60-acre, amenity-filled Astora Park featuring NYC's largest public pool and dramatic views of the RFK and Hell Gate Bridges; the Museum of the Moving Image, which has hands-on workshops for children and lots of family screenings; the original Kids Playhouse, an inexpensive indoor romping spot; and countless kid-friendly restaurants, many Greek though not all. The neighborhood is becoming more diverse every day thanks to its relatively affordable housing and all these great attractions. Our guide to Astoria has the scoop on the best places to eat, play and experience with kids. We hope you enjoy getting to know the neighborhood with your family.